I started reading the “Anne of Green Gables” series as a child. The first five books took Anne from a spunky orphan of eleven years old, trying to settle into her first real home, to the early years of her marriage to longtime sweetheart Gilbert. My interest was revived as an adult when I came upon three additional books that cover the birth of her children, their growing up, and their eventual participation in World War One, with some tragic results. Accordingly, I’ve never been able to resist any new rendition of the story that comes to the screen. To be honest, despite my fascination, some of the values that these books convey always gave me pause, even as a child. Of course, the early twentieth century was a different era from my own, and Canadian societal norms also differed in some ways from American ones. Now I find that the first season of a new Netflix series, “Anne with an E,” picks up on some of my reservations and sets out to address them. I’m not sure I would have recognized a “nature versus nurture” debate when I was young, but ideas about that certainly pervade the story. Lucy Maud (L.M.) Montgomery drew from personal experience when she wrote about the loneliness and sorrow that orphans suffer. Although not technically one herself, she endured tough times while being raised by strict grandparents. That said, considering Anne’s troubled background, it stretches credulity to present her as a bright, sunny spirit who came to the Cuthberts, the brother and sister who adopted her, as a basically sound little girl who merely needed some training in certain social conventions. This is a child whose parents died when she was three months old, and who never heard a kind word from either of the two families who took her in. She was treated as a servant and threatened with beatings if she fell short. Further, she witnessed drunken and violent scenes that no child should be exposed to. Realistically, a girl like Anne would be a handful for someone like Marilla Cuthbert, who is portrayed in the books as fairly inexperienced in life outside the peaceful confines of her Prince Edward Island village. She is unsympathetic and impatient with Anne at first, but gradually unbends as the child’s charming personality exerts its influence. 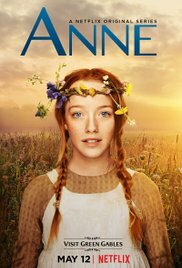 The new series, depicting as it does a more troubled Anne, seems to acknowledge that she would require careful handling from a woman who, unlike the original Marilla, approaches the task with a fairly broad mind and at least a few qualifying life experiences. It struck me early on that in Montgomery’s Prince Edward Island, the French-speaking population was a permanent underclass that existed mainly to serve the more exalted English-speaking community. Montgomery never seems to question the rightness of this system. However, in the television series, the French boy working for the Cuthberts is given an actual personality, a quick wit to match Anne’s, and ambitions of his own. There’s also an interesting twist on Diana’s great-aunt Josephine, who becomes Anne’s financial benefactor at a crucial time. In the books, she’s an old maid who has nothing else to do with her money. However, in the series, she confides to Anne the true reason why she never married. It seems she found all the contentment she needed with a female companion. In the later books, certain things continued to jar me. The newlyweds Anne and Gilbert move to a seaside community, where Gilbert sets up a medical practice. The first neighbor they get acquainted with entertains them with her strong opinions. In this predominantly Presbyterian community, the woman nurses an implacable, largely unexplained hatred for Methodists. Montgomery treats this as a harmless eccentricity. Presumably, the village is such a homogeneous society that there is no real chance of this lady ever encountering someone really different, like a Catholic, a Jew, or a person of color. Likewise, I grappled with the only serious quarrel that ever troubles Anne and Gilbert’s marriage. This comes about when Anne opposes Gilbert’s efforts to treat a head injury that has rendered a neighbor mentally disabled. Anne objects to any treatment for this man on the grounds that he was a bad husband to one of her friends, and would presumably be so again if he were restored to health. I was appalled by Anne’s berating of poor Gilbert over his determination to do his job. Surely a doctor’s wife should be aware of the Hippocratic Oath. The most compelling quality about Anne as both a child and a woman, in the books as well as the series, is her imagination. She makes up stories as easily as she breathes. At first she does this primarily to escape reality, which is too grim to bear. Later, she does it to entertain her schoolmates. It would strike anyone immediately that she is destined to be a writer, perhaps of the J.K. Rowling type. She pursues this goal for awhile as a college student and a schoolteacher, publishing some short fiction in magazines. Then she marries Gilbert, becomes a mother, and all but gives up writing, seemingly without a regret. Granted, it wouldn’t be easy for anyone to raise six children, be a doctor’s wife, and write stories on the side. And yes, women of every era have had to make difficult choices along these lines. But shouldn’t Anne, who was a born writer if ever one was depicted in literature, miss the process at least a little? If writing is in your blood, can you ever suppress the urge entirely? One of Anne’s children does become a famous poet, but is that sufficient compensation? Montgomery did not live in an era when people obsessed about “work-life balance” as they do now. Women were expected to become homemakers, and the author eventually did so herself, although not without considerable resistance. She reportedly suffered through a few failed romances in her early life, while she was still struggling to find herself as an author. Unfortunately, she failed to marry her true love (a mistake she didn’t allow Anne to make). She seems to have “settled” in her late thirties for a minister with whom she was not particularly compatible. By then, she was an established author, which perhaps made it relatively easy to keep churning out novels while raising two sons. The Netflix series takes considerable liberties with the original story, more in tone and message than in narrative detail. It shows Anne beginning to question the limited roles of girls and women in her conservative community. I hope to find that in later seasons, as “Anne with an E” grows up, she will make choices that are not as automatic and unquestioned as in the original books. All in all, the “Anne of Green Gables” stories were entertaining, but even when I first encountered them, they did not always tell me what I wanted to hear.